Nechonah and Chassidah, two wonderful girls who ran away from foster care back to their loving parents and community. On February 11, 2014 – one day after her eleventh birthday – Chassidah, after having spent six long months in a home for maladjusted youth, fled back to her family in Klosterzimmern. Now shall she again be forcibly returned against her will (seeking to break her will)… because of supposed imminent danger? Would this, in fact, be incompatible with the welfare of this very special child? Read on and see, both the parents words and their daughter’s own tender heart expressed through her words. Should this tenderness continue to dwell in foster-homes for maladjusted children? Will it thrive there…or perish? Following a letter from the parents to the district court in Nördlingen, written by her parents, Detlef & Christine Markeli, on March 29, 2014. I hereby would like to comment on the letter from Ms. Kundinger regarding the return of our daughter Chassidah. Application from the LRA Donau-Ries for handing over the child. 2. In order to accomplish the handing over of the child to the substituete custodian, direct force towards the parents who are obliged to hand her over and towards the child herself is to be applied. 3. The costs for this procedure will be charged to the parents. It is always amazing how the Jugendamt (Youth Welfare Office) base everything they say and do on assumptions as if they were facts. But actually these things are plucked out of thin air and defamatory. In my conversation with the subtitute custodian and the youth department on March 14, 2014, I explained that I do not see myself capable of acting against the conscience and the declared will of my daughter and return her to an institution in which she does not want to live. 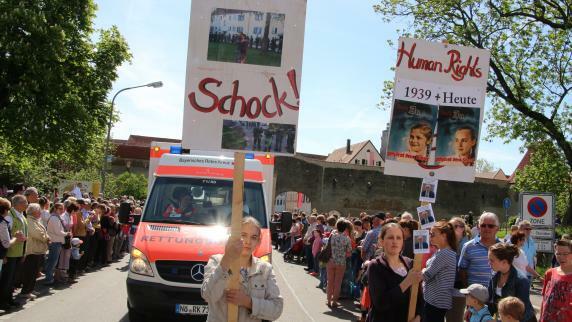 My daughter has expressed to the educators in the home, the teachers of their school, her process assistance, the Jugendamt, her supplement custodian as well as to the court itself for 6 months, that she wants to go back to where her home is: to her family in Klosterzimmern. Contrary to the assumptions of the Jugendamt no traces have ever been found of physical abuse and her clear letters and the testimony of her teachers and educators show that she has also not experienced any mental abuse on the part of her parents or the community. On the contrary – she is a bright girl with heart and courage. Increasingly distressing for Chassidah was the constant refusal of the Jugendamt to respond to her desire for contact with their immediate family. In her letters to the OLG from 18 February 2014 and March 12, 2014 it is clearly indicated that she can not live with threats by the youth office for total contact ban. Do you remember when you asked me at the hearing several times to promise you that I will not escape before you have decided something? In the Bible in Matthew 5:37 the son of God has said, “Let your yes be yes and your no, no! Everything else is from the evil one.” My parents taught me that one must keep his word, even if it is difficult. What I have done that the Jugendamt always promises me things that they do not do? For example, I asked for 5 months for my big sister to be allowed to visit me, but never did anyone listen to me. Only once, when my sister flew back to America again was she allowed to come once and the Jugendamt (youth welfare office) allowed me afterwards that my sister may call me once a week. I was very delighted then. Then, a few weeks later she suddenly stopped calling and I did not know at all why. I could not make sense of it at all and no one told me anything about that. Recently, I had learned by chance that her call had just not been forwarded to me in the home, because social services has said that she suddenly only once must call a month. The Jugendamt does not keep its word! Why had the Jugendamt said nothing to me about it? My dad has always kept his word. Please let me go back to my family. There, everything is much nicer. I heard that you made the decision that I cannot go home. I am so disappointed, because I had hoped you would help me and set me free finally. Instead Mr. Bishoff and Ms. Frisch from the Jugendamt came on Wednesday to see me. I had hoped very much that they would tell me that I could go home to Klosterzimmern. Instead they came and threatened me that they would cancel my phone contacts, if I didn’t behave properly in the home. I don’t understand that at all. First they take me away from my parents and my siblings and then they prohibit the contact with my sister and now they come with such threats. I cannot live under threats. I have tried till now to make the best out of it, but now I can’t any longer. I have kept my word, but now I had to go home. In my letter to the Jugendamt manager Mr. Kanth of 23 March 2014 I reported that threats and psychological pressure were a practice of the Jugendamt that has been applied not only to Chassidah, but also towards our now released sons and also many of the other children of our community. A home manager confessed recently towards an affected father, that he had never encountered such a hardness in the instructions of the Jugendamt as in the case of children of the Twelve Tribes. In various letters of our daughter is clearly stated that she appeals to you, Madam Judge, as the representative of the law and order, to get the rights granted to her as they are guaranteed by our Basic Law (German Constitution). She can not practice her religion. 1) Among other things it means by keeping the Jewish feasts such as the Passover and the subsequently connected Week of Unleavened Bread, Pentecost, the Day of Atonement, the Feast of Tabernacles , the weekly Sabbath and the daily morning and evening meetings. “How long will it take until I finally get home? God has given each child parents and it is my right that I have parents who take care of me. This law has given to every man to God. God has also given each man a conscience, and every child knows where it belongs. I just belong to my parents and my siblings. I think my place is no longer in the home (convent). After six long months Chassidah is still determined to live with us, her parents, in Klosterzimmern . She was not allowed to visit us once during this time. Her repeated requests that her parents or siblings could visit her more often have never been granted (except for one time at Christmas and a one-time visit by her brother Chayah ). The other girls in the home were allowed regularly to go home for the weekend and holidays. Even a girl who had beaten up her teacher (who had to go to the hospital!). But Chassidah who has never done a bad thing, was never allowed to go see her parents. I urgently await your decision! The longer you keep me here in the home, the more I want to go home. When I was deported on 5 September 2013 with all the other children of my parents and we were distributed to homes, I came here in the home with Sarah Remache under “protection of minors”. We both felt like criminals. In the “protection of minors” we could do nothing. Now I’m in a group where girls who have beaten their teachers until they were in the hospital and other things just as bad. All the girls in my group can go home, regardless of whether they have broken their teacher’s nose or not. To keep a human against his will in a place, that is like a prison for the person concerned. The Jugendamt has not considered this in regards to the welfare of my daughter Chassidah. They wish to keep her against her determined will to come home. When you speak of the “best interests of the child”, we are referring to a human being and not just a legal dispute. Above all, the concern has to be also about the mental and spiritual welfare of the child – especially his conscience. Everyone will be judged one day by how he has acted according to his conscience. The decisions he makes that are against or with his conscience, determine his eternal destiny. That’s why our Creator holds parents responsible for the extent to which they confirm and strengthen the voice of conscience in their children, or else deny and bring it to silence. As parents, we believe that we are in a direct responsibility to God, who has entrusted us with these children. We believe that God is a God of families. 3) Contrary to the assumption of the Jugendamt, Chassidah – when she was interviewed by the appeals court (OLG) – has clearly answered that she WAS NOT AFRAID to return home. The statement that a great danger be in letting Chassidah stay home, is unfounded. 4) The court has rightly observed that we parents love our children and our children love us. The Jugendamt has not recognized this in any way. 5) Chassidah was examined on March 28, 2014 by a pediatrician. She is healthy and happy to be home. Finally we would like to draw your attention to the fact that in the facility in which Chassidah was housed, there are many influences that affect some of the young people there, and with which they have approached other children, like my daughter Chassidah – other sexual orientations for her life, with which my daughter can not and does not want to identify with. My daughter has – by her own conscience – a right to be a woman and later as a wife to found a family. She has a right to be protected against such influences, which she does not desire. However, this can not be granted in such institutions. We parents have – as you have already written quite right in your decision – a protective function for our children. Therefore, we do not see us able to meet the demand of the youth services and to force our daughter against her will and conscience to return there, from where she fled to us. A forcible removal would not strengthen in any way my daughter in the faith and confidence that the court is acting in behalf of her welfare. It would shatter that. We would therefore like to urge you once again to consider all the circumstances and to refrain from forcible return of our daughter in an institution of the youth ministry. Markeli Family is Together Again! Chassidah, now an 11-year-old girl, runs home! After further discussions with her complemental caregiver* from social services and other letters to the Higher Regional Court of Munich, Chassidah was left with no more hope to be set free by the court. Now she had been away from home for more than six months and still no end in sight. That’s why without a second thought she ran away on Tuesday night, March 11, 2014, and returned home. Chassidah at home, happy with her friends. That’s Dabeqah, age 17, released Dec. 4, 2013. “I am Chassidah Markeli, I am 11 years old. I wanted to see my parents and my siblings, because I have missed them very much. That’s why I took off. Actually I was not doing well in the children’s home. Yes, I did get along well with the educators and the girls, but everything was not the way I was used to. I was not used to it, that they were always striving with one another and the educators were screaming at them. Also her brother Addar had to live in a Youth-help-facility apart from his family since the raid on September 5th, 2013. At first, his 17 year old brother Chayah was with him, but Chayah returned home already in October, because he became of age. Even though his parents and his brother visited him regularly, Addar felt like he was in the hoosegow. Addar’s letter to his judge (translation follows). Hello, my name is Addar and I was brought here on September 5th against my will. I wanted to tell you a little bit of how I am doing here. I am locked in day after day, until my parents come once a week. To me that is unjust, that all the other youths can go home every other weekend, but not me. Especially now in the holidays it feels like torture. I hang around and I almost do nothing except sit around. I am already 15 years old and have never experienced any violence. I don’t see any reason to remain any longer in this facility. In the last three months here I have worked in the wood shop and the metal shop, which showed once again that I am capable of things and that there is no need for me to stay here for 3 years. It was planned for me to have my Bar Mitzvah in autumn with another youth, but I was hindered in this through the intervention of the Jugendamt (youth office). Since I miss all the members of the community very much, I desire to be allowed to return home as soon as possible. Therefore I plead with you to reconsider the possibility to repeal the decision of judge Roser and to restore the right of my parents to take care of me. A hearty “Welcome Home” for Addar. And already one can see him with his friends in the farm. Chassidah is very disappointed… She determines that her mistreatment and abuse at the hands of the Jugendamt and courts must end. I heard that you made the decision that I cannot go home. I am so disappointed, because I had hoped you would help me and set me free finally. Instead Mr. Bishoff and Ms. Frisch from the Jugendamt came on Wednesday to me. I had hoped very much that they would tell me that I could go home to Klosterzimmern. Instead they came and threatened me that they would cancel my phone contacts, if I didn’t behave properly in the home. I don’t understand that at all. * They use this term for someone who has not all the legal rights which a guardian has, but substitutes the guardian in a certain situation in certain responsibilities. Thank you for your letter. It was very encouraging. Sorry for not writing back so quickly. I heard from my parents that they know you and your wife. All the other children and I are going again to a court hearing. I hope the judge is going to let us go home. Out here so many people are trying to make it all on their own, but I am happy we can trust our Father. I often tell girls from here much about our life and our Community. I hope one day maybe one girl will visit the Community and will be saved. Thank you very much for praying. Read about the Markeli family. Shifchatyah’s legal name is Chassidah. She is part of the Markeli family. Nechonah at age 12 is the oldest child in the Pfeiffer family.